When I moved in to my condo four years ago I knew absolutely nothing about taking care of a home. Things like installing light fixtures, or fixing a leaky faucet were completely foreign to me. Today I know slightly more than nothing, but I’m still pretty much clueless. Thankfully I have friends who are kind enough to help me out with these things. 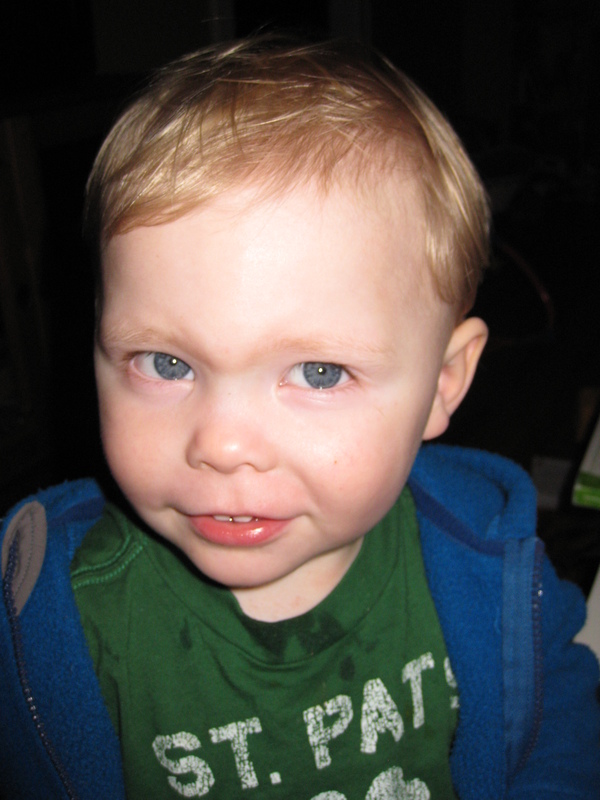 Yesterday, my friends Frank and Bianca came over with their almost two-year old son Sasha. Frank changed the light fixture in the dinning room, I made dinner, and Bianca watched Sasha like a hawk as he ran through my non-babyproofed home. Frank and Bianca have helped many times over the years, and to thank them I wanted to make sure they had a great meal. Main courses aren’t really my thing, although I think I have been getting better, so I made them an amazing dessert: Double Peach Tart from the September issue of Food and Wine. The tart tasted amazing. The crust was nice and crisp, it reminded me of a sugar cookie but a little less crumbly. The cinnamon and nutmeg went perfectly with the peaches. I think cardamom would have been nice as well. I made the tart exactly as written by Food and Wine, except for the cooking time. The magazine says to bake for an hour and 40 minutes, however my tart was done after an hour. I’m not sure if the recipe is just wrong or if my oven temperature is off. Either way, I’m really happy I decided to check in on the tart after an hour, it would have been a disaster if I had waited. Since this is another magazine recipe, I’ll be submitting it to Cream Puffs in Venice for another Magazine Monday entry. Magazine Monday’s are a chance to go through all those magazine recipes we’ve all got bookmarked to make one day. Just post a magazine recipe you’ve made and contact Ivonne and she’ll post it with her next edition. In a large bowl, whisk the flour sugar and salt together. Add the cubes of butter and cream cheese. Using a pastry cutter or your fingers, work the butter and cheese into the flour until it has a crumbly texture. Press the dough into a 10 inch fluted tart pan (with removable bottom). Refrigerate for 20 minutes. Line dough with foil and cover with pie weights or dried beans. Bake for 25 minutes, then remove the weights and foil and bake for 15 more minutes. While the crust is baking, make the filling. Blanch the peaches in boiling water for 10 seconds each. Peel the peaches, then cut 6 of them into quarters and 4 of them into slices. Using a mixer, beat butter and sugar until light and fluffy. Add eggs to butter one at a time. Add vanilla. Add dry ingredients to the butter mixture and continue to mix until well combined. Pour the filling mixture into the baked tart shell. Place the quartered peaches in concentric circles over the filling. Sprinkle with sugar. Bake for 1 hour. Check that the filling is golden and firm to the touch. Cover with sliced peaches before serving. 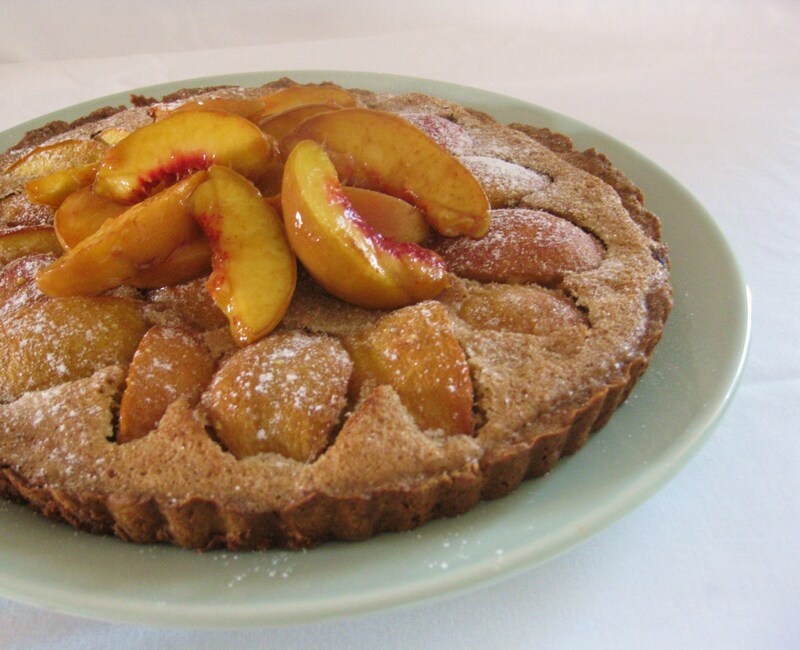 Love the idea of a double peach tart! Yum!! Absolutely delicious! I love that you added cream cheese to the crust. Now I am very curious to try this out! Yum! I saw that in my issue and have it bookmarked, but never got around to making it. So glad you did! It really ,really looks good! Glad you mentioned the Magazine Mondays as well. YUM! I’m a big fan of baked stone fruit sweets. Will try! What a great dessert. It’s really weird how the baking time was so far off. When I find a recipe like that, I always wonder who was editing that day. I am sure your friends loved to eat this tart, it sounds wonderful, what a delicious way to say THANKS! Just yummy. I want some! Thanks for sharing. Pears would be great in it! I think I’d use a little almond extract with pear too.